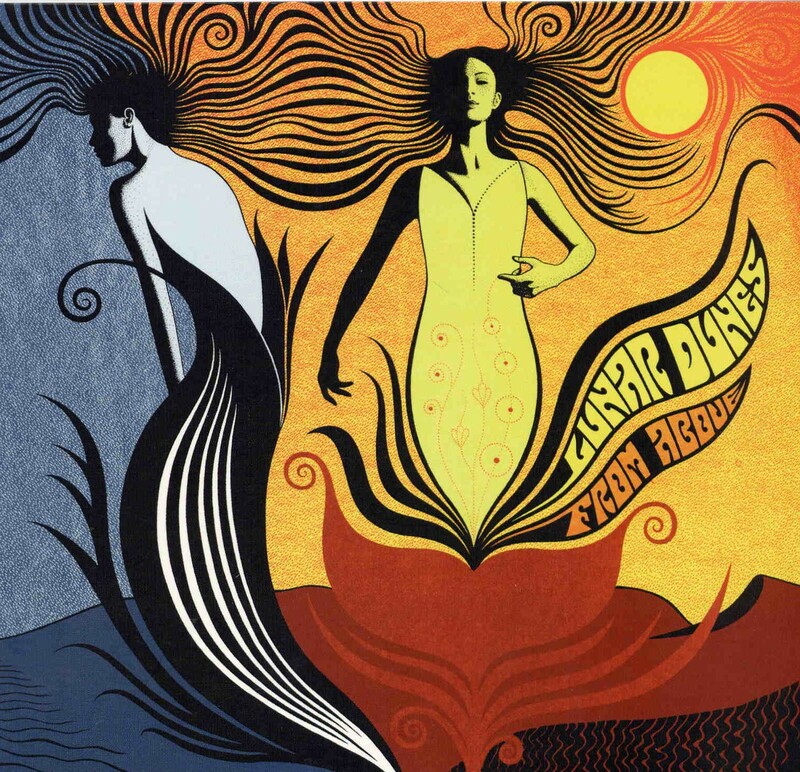 Lunar Dunes is a new band from Liverpool influenced by kraut rock, Coltrane and English psychedelia. This is their first album and was recorded in three days and mixed in five. The album includes twelve tracks and clocks in at about 75 minutes. Lunar Dunes plays energetic, psychedelic and sometimes a bit jazzy brand of instrumental space rock with guitar, bass, drums and some organ etc. The album also has some programming and features guests on cello, vocals and tampora. The album begins with two fast tracks “From Above” and “As Below”. Very nice, jamming acid rock that really works! Then a couple of more airy tracks follow. One of the best tracks is “The Todal Gleeps” that is real great, rocking space rock number that reminds me a bit of mid-90’s Porcupine Tree due to the programmed bits. “Seaspray” is a sunnier, groovy and jamming track in two chords. Then we get two more peaceful tracks with hazy atmosphere, very nice. Tampora brings in a superb, oriental feel to the excellent track “When I Was on Horseback”. The last track “Scatter” is the most free-jazz oriented piece on the album with some funky, freaky guitar work. This is a really nice and suitably varied album and comes in a very fancy and stylish cardboard sleeve. Highly recommended! From London, England comes the debut from Lunar Dunes, an instrumental psychedelic space rock band that really knows how to lay down a cosmic groove. At times they sound like a more acid rock version of Ozric Tentacles, and at others they reminded me of bands like Hidria Spacefolk, that are firmly in the space-psych realm, though the tight playing and solid musicianship gives the music a progressive rock edge as well. But they really excel at just laying down cool jamming melodic, meditative, mind massaging groove tunes. Most of the tracks are in the 5-10 minute range, which for Lunar Dunes seems to be the perfect timeframe to stretch out and develop their music. Kind of like Oresund Space Collective but shorter and more tightly structured tracks. Among the highlights on this 12 track set is "Herzegovina". It has a core melody that feels like some kind of psychedelic spy movie soundtrack. But surrounding that we've got head thudding percussion, female vocal chanting, and an all around trippy groove. Tribal percussion propels the easy paced, bouncy, lightly meditative melodic "Loophole". "The Todal Gleeps" is an Ozric styled rocker with ripping guitar licks. An excellent spaced out jam tune. I love the Eastern vibe that the sitar, guitar and percussion give to "When I Was On Horseback". "Scissorbell" is one of darkest and moodiest tracks of the set, with a psychedelically foreboding atmosphere. But in its last couple minutes it picks up the pace and rocks out in space. "My Lagan Love" has a simple yet seductive guitar melody that leads the music pied piper fashion, followed by what at this point we can call trademark Lunar Dunes space grooves and atmospherics. Nice violin accompaniment too. Close your eyes and float awaaaaaaaaay. Finally, "Scatter" is a relatively brief but powerful track that really smokes, and covers a tremendous amount of ground in less than 4 minutes. If you just want to chill out and be swept away into space, you'll surely dig Lunar Dunes.